The requirements in the competition brief were to create a magnificent academic library for science and research, which would at the same time be a meeting place engaging the local community. The University of Aberdeen was established in 1495, and the University library holds one of the world’s greatest collections of books, some of which date back to the thirteenth century. The architecture of the new building creates an advanced learning environment in which the latest technology adds value to a magnificent collection of over one million books. Architecturally, the heart of the library is a spiralling atrium connecting all eight storeys, and as a dynamic vortex, this space contrasts the clean cut exterior profile. Furthermore, the building is designed to meet the highest sustainable standards, minimising long term running costs and energy use. The library has been certified BREEAM Excellent. 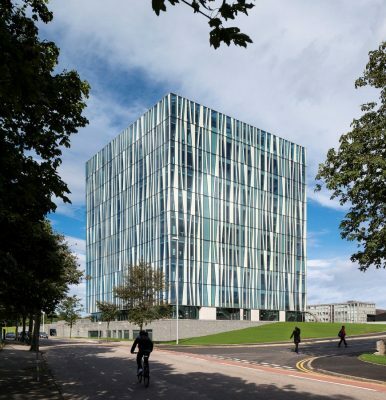 Consisting of an irregular pattern of insulated panels and high performance glazing, the façade not only allows plenty of daylight to penetrate into the building but also offers a great view over the city of Aberdeen. 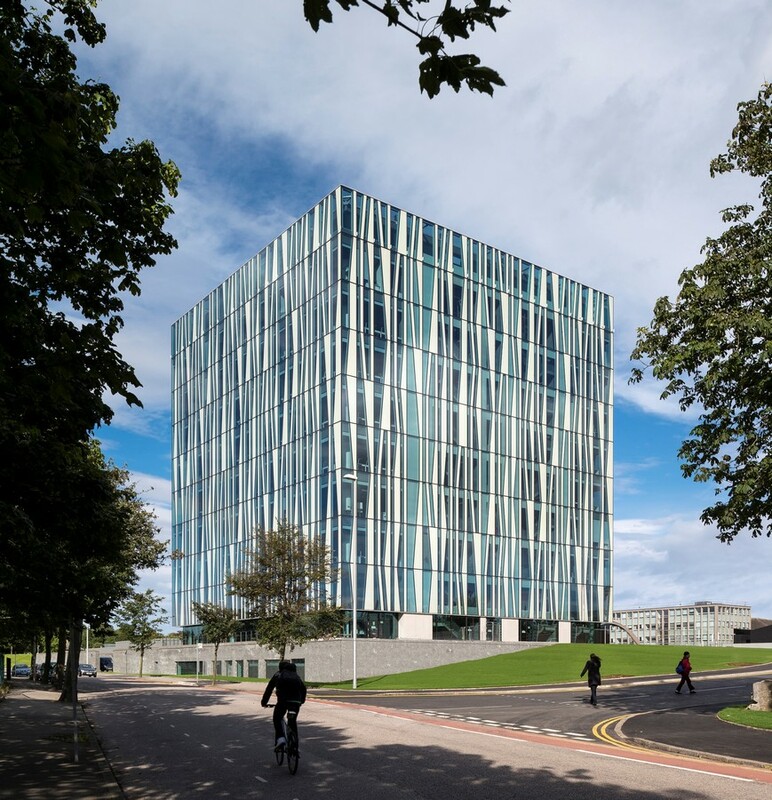 At the opening ceremony, the University of Aberdeen New Library will be named the ‘Sir Duncan Rice Library’ in recognition of the vision, ambition and leadership of the University’s former Principal and Vice-Chancellor, Sir Duncan Rice. schmidt hammer lassen architects has an extensive track-record of libraries, from university and national libraries to public libraries. Currently, three libraries are under construction: The largest public library in Scandinavia, called Urban Mediaspace in Aarhus, Denmark, to be finished in 2014, and two libraries in Canada, one in Halifax and another in Edmonton. The most well-known library by schmidt hammer lassen architects is the extension to The Royal Library in Copenhagen, Denmark. schmidt hammer lassen architects has worked out of London since 2006. Among the most renowned learning environments designed by the architectural practice is City of Westminster College in London, which had its official opening in May this year.